Ireland Expected To Become World's First Country To Divest From Fossil Fuels The lower house of parliament OK'd the bill, which is likely to sail through the upper house too. "We are ready to think and act beyond narrow short-term and vested interests," one lawmaker vowed. 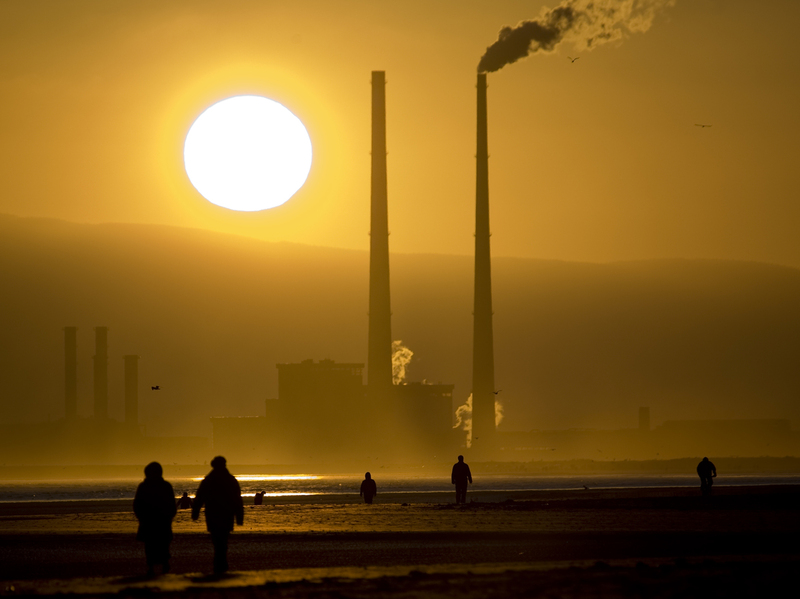 Smokestacks loom over Bull Island, northeast of Dublin, in 2008. The Republic of Ireland took a crucial step Thursday toward becoming the first country in the world to divest from fossil fuels. Lawmakers in the Dail, the lower house of parliament, advanced a bill requiring the Irish government's more than $10 billion national investment fund to sell off stakes in coal, oil, gas and peat — and to do so "as soon as practicable." The bill now heads to the upper chamber, known as Seanad, where it is expected to pass easily when it's taken up, likely in September. If the bill becomes law, as anticipated, it would rid the European nation of holdings valued at more than $370 million, according to Trócaire, an Irish Catholic aid organization that has pushed hard for the bill. The principal force behind the bill, independent lawmaker Thomas Pringle, praised the move Thursday as a "moment where we commit to getting serious." "Let us show the Irish public and the international community that we are ready to think and act beyond narrow short-term and vested interests," he told his fellow lawmakers, "and will take the opportunities that lie ahead of us to bring in real change." Ireland's decision to divest from fossil fuels staggers me. It's one of the landmark moments in what has become the largest campaign of its kind in history. Such thanks to all who fought. The move also sets Ireland on a pioneering course. While several faith-based organizations, universities and even major cities, including New York City, have announced their intentions to divest their multibillion-dollar pension funds from fossil fuel companies, few countries have thrown their weight behind such a course. Norway's parliament voted in 2015 to sell off its coal investments, and the country's central bank has recommended that its $1 trillion sovereign wealth fund divest from petroleum companies — but no country yet has shed all of its holdings in fossil fuels. Despite Thursday's vote, Ireland has not exactly been known as a champion of renewable energy. For instance, the country ranked dead last among European Union member states in the 2018 Climate Change Performance Index, an annual study assessing national climate policies, and nestled comfortably in the bottom quarter worldwide, just seven spaces above the U.S.
"Ireland has gained a reputation internationally in recent years as a 'climate laggard' ... so the passing of this Bill is good news but has to mark a significant change of pace on the issue," Trócaire's executive director, Éamonn Meehan, said in a statement Thursday. Campaigners argued the move should help the country get on track to uphold its commitments in the Paris Agreement, the major international environmental pact of which it's a signatory. But one of their principal arguments had less to do with Ireland than with countries elsewhere in the world, which are already feeling the devastating effects of climate change. "We must be very clear; people are dying today as a direct result of climate change through the increasingly frequent and intense disasters, through increased hunger, increased water scarcity," Pringle said Thursday, "and significantly more will die or be forced into displacement if there is not a radical change in direction."